How is this for a surprise: Microsoft today announced that it is joining the Linux Foundation as a high-paying Platinum member. “This may come as a surprise to you, but they were not big fans,” Linux Foundation executive director Jim Zemlin told me about his foundation’s history with Microsoft. The new Microsoft under CEO Satya Nadella, however, is singing a very different tune. Today’s Microsoft is one of the biggest open source contributors around. Over the course of just the last few years, it has essentially built Canonical’s Ubuntu distribution into Windows 10, brought SQL Server to Linux, open-sourced core parts of its .NET platform and partnered with Red Hat, SUSE and others. As Zemlin noted, Microsoft has also contributed to a number of Linux Foundation-managed projects like Node.js, OpenDaylight, the Open Container Initiative, the R Consortium and the Open API Initiative. 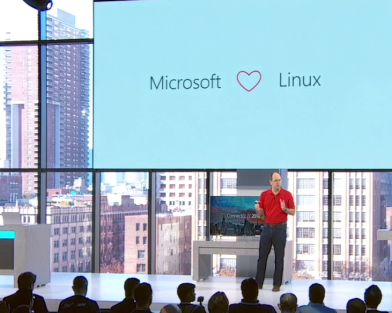 Despite all of that, today’s announcement will still come as a surprise to many, given that Microsoft and the Linux community often felt like they were at war with each other in the past. Zemlin acknowledged as much when I talked to him. “There will be some skepticism, but that will be from a smaller group,” he said. “There is an anti-establishment sentiment in open source. That’s natural.” He added that whenever a major corporation goes open source, that’s what happens. But he also noted that Microsoft has been “walking this talk for a very long time” now. Other Linux Foundation Platinum members, which pay about $500,000 for the privilege, include Cisco, Fujitsu, HPE, Huawei, IBM, Intel, NEC, Oracle, Qualcomm and Samsung. Google, Facebook and more than a dozen other prominent open source users are Gold sponsors. John Gossman, an architect on the Azure team, will join the Linux Foundation Board of Directors. NEW YORK—At its first Connect event in 2013, Microsoft released Visual Studio 2013. In 2014, it announced the open sourcing of .NET, and in 2015, the open sourcing of the Visual Studio Code editor. The big news this year? Microsoft, the company that has built an empire on proprietary, closed-source software, has joined the Linux Foundation as a platinum member. Microsoft’s increasing commitment to open source has been met with some cynicism (and please, beloved commenters—try to refrain from “embrace, extend, extinguish” posts, as the very concept is preposterous when it comes to Linux), but with projects such as Visual Studio Code and .NET, is starting to win hearts and minds. The company does appear to be a reasonably good open source citizen, not merely publishing source code repositories that are occasionally updated from an internal development branch, but actually performing development in the open, accepting community contributions, and seeking community consensus when it comes to new features. This leads to a second surprise membership: Google is joining the .NET Foundation and will be part of the Steering Group. While some parts of Google have been very warm to some Microsoft projects—in particular, the developers of the Angular framework are fans of the TypeScript language and Visual Studio Code—this nonetheless feels like a surprising move. Google has shown little interest in .NET, and with Android is in fact heavily invested in Java, .NET’s major competitor. However, .NET is still a major part of corporate development, and it would likely serve the company well to improve .NET support in Google Cloud Platform, if nothing else. Samsung is already a member of the .NET Foundation, and has .NET news today too: The company is releasing a preview of Visual Studio Tools for Tizen, allowing developers to build .NET applications for Samsung’s non-Android smart devices, such as TVs, wearables, and Internet of Things gizmos. One of the pieces of news that Microsoft hoped would make a big splash was the release of Visual Studio for Mac; unfortunately the company spoiled the surprise itself, by publishing the news prematurely. The name is a little misleading, as the new Mac development environment is a derivative of Xamarin Studio rather than a port of Visual Studio. As we wrote on Monday, they’re not completely separate: core portions are identical between the two, and Mac and Windows developers will be able to share projects between platforms with ease. Again spoiled by Redmond, the next version of Visual Studio has a name, too: it’s Visual Studio 2017, and there is a release candidate is out today. SQL Server 2016 Service Pack 1 is also out today. This would normally not be tremendously interesting news, but this Service Pack has a difference. Traditionally, the different versions of SQL Server (Express, Standard, and Enterprise, from smallest to largest) have offered different features. They’re all built on the same core engine, but some capabilities, such as in-memory transactional databases, were only available in the more expensive versions. This made it hard for developers to justify using those features; if customers may be using a mix of Standard and Enterprise, for example, many developers will stick with the Standard feature set, and ignore Enterprise capabilities. Service Pack 1 makes all SQL Server versions functionally identical. They still have differences in terms of the number of processor cores and amount RAM they can use, but going forward, that’s the only difference between SKUs. Microsoft’s hope is that this will result in greater adoption of previously high-end features such as data warehousing and transparent database encryption. The company made a similar change with Windows Server licensing a few years ago, broadly unifying features across SKUs, using the different price points to govern hardware scaling and virtual machine licensing. Alongside this, the company is releasing a preview edition of the next version of SQL Server—for Windows and, for the first time, Linux. In developing SQL Server for Linux, the company says that it was strived to make the database engine work and act like a native Linux application to as great an extent as possible. Installation, for example, will use RPM or DEB packages (depending on distribution), and it will support running within Docker containers. Microsoft is not offering full feature parity in this release, but it says that all the major engine features, including the in-memory capabilities and encryption, will be cross-platform. Major administration will continue to use the Visual Studio-based tooling that the Windows edition uses; for most intents and purposes, the two versions should be interchangeable, with few differences visible to developers. The initial announcement of SQL Server for Linux caught many off-guard, as it wasn’t immediately clear who would want to use it, or why. That’s now becoming somewhat clearer: avoiding Oracle. SQL Server has a rich and diverse feature set (especially with the feature unification across SKUs), and is typically somewhat cheaper than Oracle. That makes it appealing even to Linux shops.